Checks are not returned with monthly statement. Submit your online application by clicking on one of the choices below.  Once submitted a Mohave Community Federal Credit Union Representative will contact you. Checks are not returned with monthly statements. Beginning October 2017, Visa will automatically implement a program called VISA ACCOUNT UPDATER (VAU). This program will insure that merchants who process your monthly recurring charges will have up to date card information. If you lose your card or the expiration date changes, Visa will update current card information to merchants that participate in VAU, so there is no interruption of service. You will automatically be enrolled in this program; however , if you wish to opt-out of the VAU service, please complete this Opt Out Form (PDF-new window/tab) and return it to the credit union. Get a text or email whenever you pay with your Visa Card. Get alerts for transactions in real-time and immediately identify potentially fraudulent activity. Track spending and stay on top of account balances. Adjust your alerts to what makes sense for you and receive them via SMS text or email. Mohave Community Federal Credit Union offers several options for earning a good return on your savings. Our rates are always competitive. Call or stop by today for current rates. Every member of MCFCU has a Regular Share (Savings)Account. It represents your “share” of ownership in the credit union, and it requires that a minimum balance of $50.00 be maintained at all times to keep your membership open. Dividends are calculated daily and paid quarterly. Start Saving TODAY for your much needed vacation, tomorrow! The holidays are fast approaching! Start saving TODAY! This account offers a dividend bearing checking account to individuals or businesses. reclassify the account to a regular checking account without notice to the member. Checking account with an Overdraft Protection Line-of-Credit. Funds are transferred to your checking account in $50.00 increments to cover overdrafts. There is no annual fee. Request this option and funds will be transferred automatically from your Share Savings Account. Make your money work harder for YOU with a Term Certificate from Mohave Community Federal Credit Union. It’s a secure way to invest, and yields more interest than a regular savings or money market account. We offer tiered rates for an even higher return on your money. Terms range from 6 months to 5 years. Choose the term that best fits your needs. When the term ends, you can choose to reinvest it to earn even more! Money Just Doesn’t Grow On Trees….. Whether it’s for your child’s education or your retirement, an IRA is a great way to plan for the future. Mohave Community Federal Credit Union offers you a number of IRAs to choose from, including Traditional, Roth, or Educational. Consult with your tax advisor about which type of IRA is right for you. If you would like to enroll in Virtual Branch Online Banking, please contact a friendly Member Service Representative at 928-753-8000 today or submit the enrollment application below. Get ONLINE… not in line. Do your banking online 24/7 and manage your Mohave Community Federal Credit Union accounts from the comfort of your home, office, or anywhere in-between. Enroll today! All transactions are conducted within a secure environment. Don’t spend your lunch waiting in line! Sign up for Direct Deposit and your paycheck, Social Security, or pension check will automatically be credited to your credit union account every pay day. Direct Deposit is the electronic transfer of payment from a company or organization into your MCFCU checking or savings account. Direct Deposit is a smart way to get paid, and is ideal for more than just payroll, such as expense reimbursements, tax refunds, and pensions. Direct Deposit is safe, confidential, convenient and fast! Saves Time! No more waiting in line! Pay is always deposited.. even if you’re sick OR out of town! It’s so easy to switch any recurring deposit. All you need is Mohave Community Federal Credit Union’s routing number: 322172221 and your entire 10 digit checking account number. Your 10 digit checking account number can be found at the bottom of your checks. Don’t have checks for your account?? No worries! 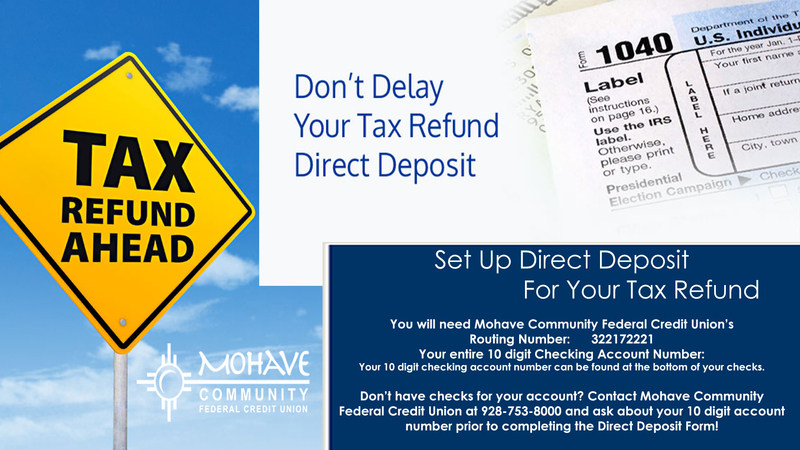 Contact Mohave Community Federal Credit Union at 928-753-8000 and ask about your 10 digit account number prior to completing the Direct Deposit Form! Contact Mohave Community Federal Credit Union at 928-753-8000 to reorder your checks. Please have your entire 10 digit account number (located at the bottom of your checks) and the check number that you would like to start off with ready before ordering. 55 years of age and older receive one box of free checks per calendar year!